TRAINING MANUAL LINKS – WHO? WHAT? WHEN? WHERE? WHY? HOW? Here are two stories that happened after school. 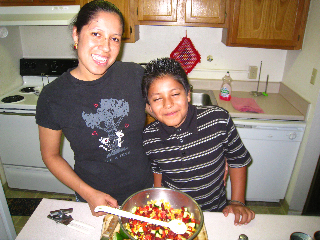 Jose and his mom shared this photo of them making a corn and bean salad at their home. 5th grade students created a story “Healthy Food Ideas for the Future,” that met in their classroom, after school. Quieter classrooms/library/meeting place – AFTER school, the rooms are quieter, and so are the hallways. This makes recording a little easier. Although remember that you want your group to stay small enough to manage (No more than 8 students per Eat Your Radio adult, and sometimes 4 or fewer is even better) Also you need enough room so that two groups can be recording at the same time in a quiet place, so they don’t mess up the sound of the other group. Also, you might want to be sure the janitor’s schedule works so that you don’t have the vacuum going while you’re working and recording. Field Trip options – AFTER school can be an easier time for field trip options, for instance, walking to a local grocery, or going to help a family cook a meal at home. Get signed parent approval for any child who will be in the after school class. Make sure the approval includes phone numbers for reaching the parent, and whether the student will be picked up by the parent or has permission to walk home. End the class at least 20 minutes before the front office closes, and have a plan with the front office for what to do if a parent has not arrived yet to pick up their child. Be sure to have healthy snacks and water for students who work on Eat Your Radio AFTER school. Sometimes, you can arrange those snacks with the school cafeteria or with the parents and children. Or perhaps the students can fundraise to help get the healthy snacks.